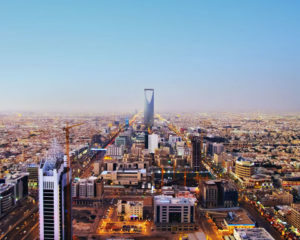 NASHVILLE, Tenn.–(BUSINESS WIRE)–The Arriyadh Development Authority (ADA) of Saudi Arabia has selected TransCore to design and implement an advanced traffic control system to improve the flow of traffic for the seven million people living in Riyadh. For this $100 million transportation project, TransCore will deploy its TransSuite® software solution to manage traffic signal operations at 350 of Riyadh’s busiest intersections. The system automatically adjusts traffic signal timing in response to real-time traffic conditions, representing a significant upgrade over the existing fixed-time system. TransCore’s approach to this project includes integration of its TransSuite Advanced Traffic Management System (ATMS) with an adaptive control system to reduce congestion in the Kingdom’s capital city. The software-based solution combines data, real-time communications and analytics to handle both routine and unexpected traffic conditions, and to facilitate immediate communications among agencies responding to an emergency or abnormality. TransCore first established an office in the Middle East in 2006 with the design and installation of the Salik Toll System for the Roads & Transport Authority in Dubai. Since then, TransCore has continuously expanded and operated the Salik system, which was recently awarded the 2014 Toll Excellence Award in Technology by the International Bridge, Tunnel and Turnpike Authority. Developed as a set of scalable, integrated traffic management software modules, TransSuite provides graphical information with a dynamic map interface. Agencies can select the applications that best meet their needs and manage all system intersections from a central command and control center. By integrating traffic controllers and sensors with an area-wide communications network, traffic engineers can monitor and analyze current congestion, and take steps to alleviate congestion before it gets worse. TransSuite’s integrated solution has been effective in large traffic signal control systems, including TransCore’s award-winning project developed for New York City.